Following on from Leila Sykes’ (Anonymous Is A Woman Theatre Company) post about her time at this year’s National Rural Touring Forum (NRTF) Conference, we will now hear from husband and wife team, Andy and Jan from Jestaminute Theatre, who also attended the conference as part of DART. Jestaminute Theatre is based in Redditch and the company uses performance and media arts to enhance the life and well-being of the residents in the Midlands. Andy and Jan tell us about their time at the NRTF Conference…. “After a smooth journey across country we arrive in lovely Norfolk. After a little detour (!) around the area to find a café for lunch we settle on somewhere in Wymonham for a toasty sandwich. A retracing of steps back to Wymonham College to register – a slight disappointment as, after packing two cases and two sets of toiletries, we discover we are sharing room! So no peace from the snoring then! A lovely friendly atmosphere and welcome from NTRF and Live & Local staff. A quick cuppa and settled down for opening presentations – very inspiring. 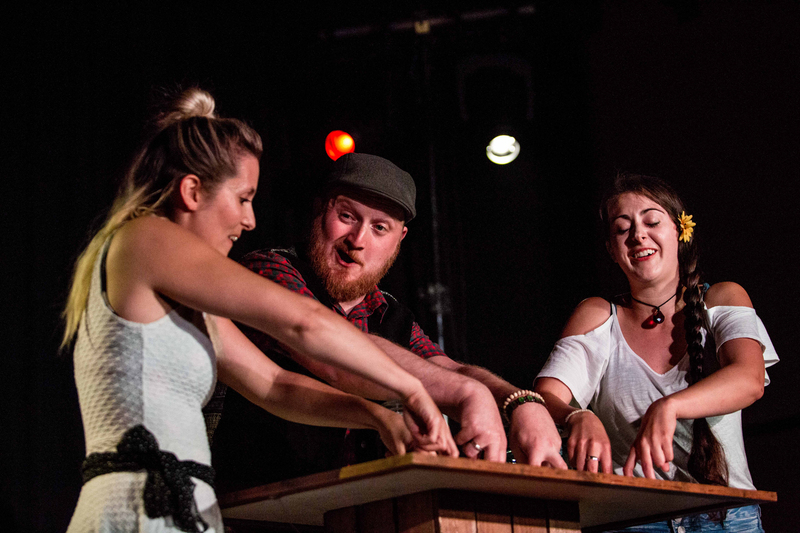 A little look at our first showcase – ‘Pubbetry’ by StrangeFace – and then off with a little trepidation to our meeting with Relationship Manager Jill Brown from ACE. No need to have worried – a brilliant chat and good advice – hope it translates into a successful outcome for our current G4A! Schooldays memories for dinner in the canteen and then off on the coach to The Regal Cinema, Wymondham. for some more showcase performances – highlights were inspiring dance ‘H2H’ by Joli Vyann and music by Loren Barrigar and Mark Mazengarb. A drink in the bar and some good networking with someone who does folk music and lives on a canal – a useful good contact as we are (subject to funding) going to be doing some oral history and music work on our local canal. A good night’s sleep before a full day of activities starting with more showcases – puppets, balloons and books; and then some more informative presentations before lunch, (no good for the diets!!) . Then a dividing of effort as we head off to the parallel sessions – Andy off to ‘What does “strategic” mean for rural touring?’, and Jan off to ‘Using research to evidence the social impact of rural touring’; followed by sessions on ‘Reimagining the Rural Tour’ and ‘Focus on core income’. We met up with our fellow Worcestershire thespians Anonymous is a Woman Theatre Company and had some lovely chats, before one of them was drawn from the audience into another showcase, ‘L’Hotel’, and was married off! Another trip out – this time Connaught Hall, Attleborough, for dinner and some more inspiring showcases. Highlights were ‘Amsterdam’ by Chanje Kunda – a one person show (again useful for us as our next main project will be a one man show), and ‘Wanderlust’ by The Gramophones – based on oral testimony (again something which chimes with our work). Off to the bar and a fortuitous meeting with an actress whom we’d worked with in the past and had engaged to work with on our next project, and another networking opportunity with a theatre company who are based in Brighton, so some good conversations around the festival. On the final day, the last few showcases / presentations included highlights ‘The Powercut Compendium’ by Cartoon De Salvo, ‘The Boy who Became a Beetle’ by Little Earthquake & Black Country Touring (another good local contact made! ), and finally the utterly brilliant ‘My Big, Fat, Cowpat Wedding’ by Kali Theatre, Black Country Touring & Arts Alive. Another breakout session with some useful lessons about crowdfunding. To find out how you can benefit from the DART programme, please click on OPPORTUNITIES FOR ARTISTS or OPPORTUNITIES FOR PROMOTERS & AUDIENCES.